I’ve spoken before of my year as a waxing and waning of which traditions/pantheons hold more sway. As we have just celebrated the Kemetic New Year, I am currently in a very Netjer-dominant headspace. During Retreat I had even decided (or probably had it mentally “suggested”) that I take a bit of a hiatus from honoring my other gods and spirits. This way I could give myself a chance to absorb and integrate everything which had happened during my week among the spiritual nation. In truth, I didn’t mind doing it either. While I was co-leading the discussion with Imti on practicing multiple traditions, I found myself again thinking, and saying, that my life would be much easier if I did not have so many claims on my spirit. Having three weeks (the week of Retreat and the past two) where I only focused on Them has been quite relaxing. And it has made me wonder: COULD I “just” be Kemetic? Possibly. Probably. I even think Everyone Else would understand if I did so. But I can’t. I just can’t get away from Them. Especially the Heathen side. When it inadvertently comes up relating to a very specific modern Kemetic item, I know there is no escape. I like it that way. Syncretism. All these crossed paths. Things working their way into everything else. I even head a story connecting a lwa with one of the Names during Retreat. Don’t know if it’s one that I can share publicly as I was not there for the original incident. But it is one of those stories which gives you a big whack on the head that Gods and spirits are much bigger than we can imagine and our modern UPGs may have a lot more stuff behind them. Last month I hosted a chat for members of the House of Netjer on syncretism. It was very interesting for me because I got to see a) just how well my traditions work together and not everyone has that experience and b) how much more I can potentially cover in talking about syncretism. Happy Monday everyone. My semester is quickly coming to a close, and it has been much less painful than the last one. But school still claims the majority of my time and brain power. So today I shall share a few news items I’ve recently collected. First, from Dave Haxton, a story about Day of the Skulls in Bolivia. Beloved indigenous holiday and that Catholic church isn’t too thrilled about it. I’m coming to believe that syncretism is as natural for humans as veneration of the dead. Certainly many spiritual practices would have died out had they not been adapted into new belief systems as they were introduced (or forced) on to people. Second, from a few sources, an amazing archaeological find from Denmark depicting a figure in a high seat. At first it’s thought to be Odin… until someone noted that the figure is wearing a DRESS. Valgrind noticed that the only person allowed to sit in Odin’s high seat, Hildskjalf, is Frigga. Perhaps this is Her, or Freyja, or an Odin-dedicated seidhkona. No matter who she is, I hope someone makes copies at some point because I would love one. Finally, an article I found a few weeks ago and didn’t save the source. Be lucky: it’s an easy skill to learn gives both good advice and is also very much in line with the concept of hamingja. I haven’t had time to dig up additional material to develop it. Instead, I present it as is and suggest you try it if you feel your luck is waning or worse than you want it to be. In book news, I am back to reading Hedge-Rider by Eric de Vries. In lieu of possibly writing a review later, I will note that I’ve been enjoying this take on witchcraft very much. Rather than a spell guide, the Hedge here refers to the witches who walked the boundary of the wild and civilization. Drawing on Germanic mythology and folklore, de Vries makes a case for medieval witches (yes, the kind you find in Inquisition “confessions”) belonging to that culture and regularly journeyed to the Underworld and worked closely with their fylgia. This belongs on your shelf next to your copy of Witches, Werewolves and Fairies. This is a post I’ve wanted to do for a while now. Several of my friends who are spiritually active and have close relationships to their Gods have mentioned reserving specific days to honor Them. I’ve been building such a schedule myself over the last two years. In that time a lot of the days have become well-established and have done a lot to strengthen my own spiritual bonds. I have also been toying with the idea of a primer, a “syncretism 101,” and this seems a good place to start. What’s the point of such an activity? In addition to forging bonds, it also helps to establish a personal practice, discipline, and getting to know Them better. I also find that it helps me in my “regular” life to keep that connection even when it seems like life is conspiring to take it away. There are practices that I do every day: Senut (purity permitting), yoga, soul alignment (from Feri tradition), and pulling a rune. The latter three have been part of my morning for so long I feel incomplete without them. I’d sooner go outside naked that not doing those things. Further, each weekday has a specific focus for me. Some of them are traditional, some are not. In Kemet, each week ran ten days, so our beginning day of the week would not match up to their calendar. No matter the structure though, I think Wepwawet likes the first day of the week. New beginning, new opening. On Mondays I like to sit in front of my senut shrine in the evening and having an informal chat with Dad… and usually a drink. I haven’t really spoken about it here, but I have a much more than passing interest with Vodou. While I don’t do much for the lwa in general, Ezili Danto came out in a card reading I got from a mambo a few years ago. As soon as that happened I started lighting candles for her on her traditional day: Tuesday. Wednesday is likely obvious. Woden’s Day, Onsdag in Swedish, it IS Odin’s Day. 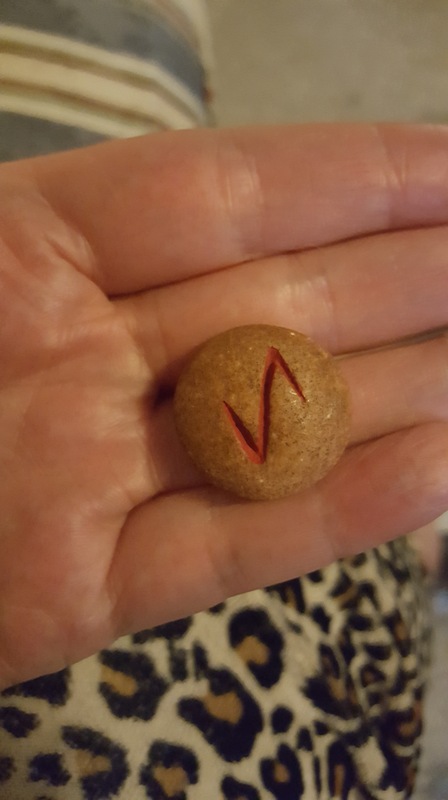 This year I’ve spent most Wednesdays doing some form of rune work and talking to Him when able. I also sometimes will spend some time with His son, the great Skald. For the longest time, Thursday had no claim. I’ve never had a connection with Thor, so the obvious choice was out. The decision to make this day for Seshat was recent and not for any other reason than She’s my Beloved, very important, and ensures She gets at least one day a week of focused Senut. I might try to do more writing on those days too. This week Her day will come one day earlier. Tomorrow, by the House of Netjer’s ritual calendar, is Her festival. I can’t NOT celebrate! Friday, we return to traditional definition of name days. Frigga or Freyja, who knows which of Them the day was originally named for. On this day I honor the goddesses: Frigga, Gunnlod, Idunna, Bestla, and Freyja. Recently I’ve been toying with the idea of dedicating Saturdays to the wights and netjeri and Sundays to my ancestors. Maybe when the semester is over and I don’t have to worry about assignments I can do something for them. In addition, when the moon is dark I turn my thoughts to Hekate. I’ve been using my friend Dver’s suggestions for holy days as a guide to developing what I do on these days. I have jewelry specific for some of my Gods: jackal pendant, valknut, lots of amber, a key and lock necklace I bought for Hekate. It’s quite common for me to wear blue on Wednesdays. My collection of oils from Black Phoenix Alchemy Labs is still extensive enough that I have scents to fit the God of the day. Someday when I have more space for shrines, I’d like to develop them more fully and have the area around them fit for my sitting and doing Work. Do you do something similar, whether you practice one or many traditions? I know a few of my friends have developed their own schedules. If you have, feel free to comment. A discussion of saints in medieval Iceland included the idea that possibly that the worship of saints replaced the worship of the Heathen Gods. I’m sitting here and pondering the implications of this. I do have a decent knowledge base regarding saints and their syncretism with the lwa and orishas in African religions, but what I know of ATR is that it’s potentially easier to adopt this world-view. Catholicism, Vodou, and Yoruba-based faiths include the idea of God being immense and somehow removed from this world, and the saints/lwa/orishas act as intermediaries to God and more likely to be involved in the workings of this world. As far as we know with Heathens pre-conversion, there was never such an idea around the Aesir and Vanir. We shall have to see how this develops. Originally I described myself as multi-trad, as it easily summed up the fact that I work in multiple (usually reconstructionist) traditions. A few months ago, some discussion involving terminology came to the front with other people who also work within multiple traditions. My friend Erynn posted some interesting thoughts on the subject of eclecticism vs, syncretism, and I found myself agreeing with how she was approaching the two words. What usually happens with me is I will get “tapped” by a God or spirit. As I start to learn about T/them, inevitably I find myself looking at their culture. In order to understand a God fully, you have to understand the culture from whence they originate. To do anything less is disrespectful in my book. I know I am far from the only Pagan of any sort who’s involved in multiple traditions. I’m also sure there are a lot more of us than we know*. Hopefully the dialog will continue as more of us crawl out of the woodwork. I am also still considering the use of the term syncretic and wondering how well it fits in my psyche. The jury may still be out, but I find part of me likes the idea of possibly reclaiming a term and potentially reshaping it. *And I am not counting in ye generic neopagans who do perform the “one pot cooking” method and ignore much historical and mythological record. Sometimes it’s also a recipe for total disaster.